The MATRIX Police is a special number plate recognition software, which until now has many times proved the efficiency and reliability. 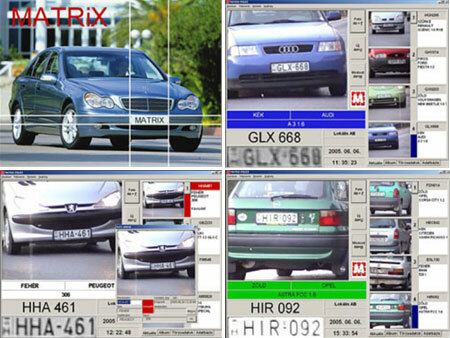 The Hungarian police has been using this number plate recognition system since 1994. 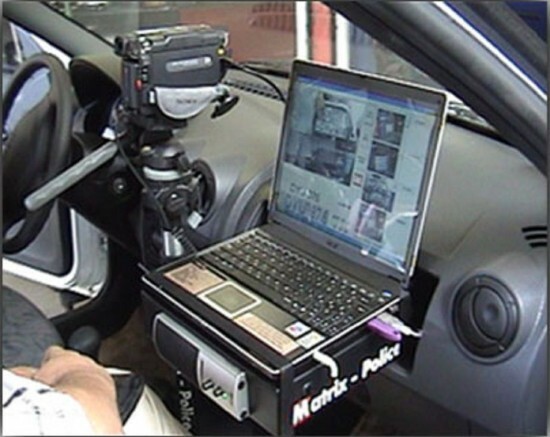 The Matrix Police can be installed in a patrol car and is able to catch the licence plate number of vehicles even at high speed. The Matrix Police automatic number plate recognition system consist of a traffic monitoring video camera, an image processing computer and the needed connection cables and power supply. The computer digitalize the video signal from the camera. The image processing program determines the set of pixels in the image of the number plate and a special character-reader program recognize the letters and the numbers. How works the number plate checking? The system compares the “seen” number plate with the datas in its own internal database or with the datas in a remote server. The result will be displayed on the screen, and will be read aloud by human voice. The computer stores the licence number of each vehicel for later control and analysis with date, time and even with photo (depending on the setting). It is important to dispose the computer and the camera and their adapters and cables in a professional, civilized way because it is not only about the protection of the system, but it helps the patrol work and increases his comfort – in a word increases the system’s utility value. We therefore recommend that the patrol car in order to protect the device (which can affect your warranty) pay particular attention to the installation location of the Matrix Police ANPR system.